Robert Priseman is an artist who has spent the past decade exploring the darker side of human nature in an effort to expose its gentler and more understanding heart. Believing that fundamentally we are all kind and share a desire to help each other, the thought that we can also be cruel, destructive and vindictive is a great mystery to him. Fueled by the desire to understand what motivates us to behave in the ways we do Robert has tackled subjects in his paintings as wide ranging as the Holocaust, suicide and civil war. Building on these previous series Robert now presents a selection of new works looking at the phenomena of high school shootings in the USA. The exhibition will consist of three sections. The first consisting of seven portraits of Dylan Klebold, each based on photographs taken of him at various stages of his childhood. Dylan was one of the two senior year students who carried out a rampage shooting at Columbine High School in Littleton, Colorado on the 20th April 1999 and is one of the focuses of the exhibition. 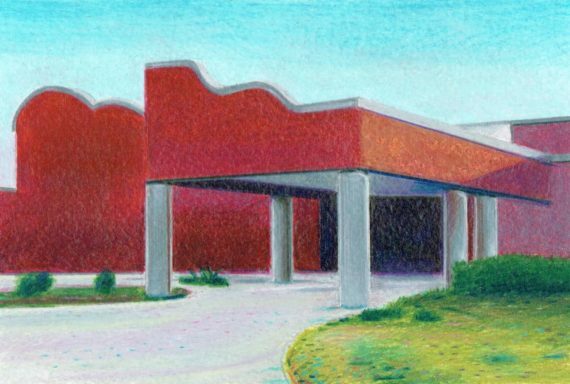 The second set of pictures is a group of nine drawings of the outsides of schools in the USA where students have carried out shootings, employing coloured crayons as a medium so that the pictures might resonate with the drawings children produce. The third part of the exhibition consists of five oil paintings which depict the insides of empty class rooms and school corridors where shootings have taken place. They are deliberately empty of people so that we might imagine ourselves standing in them, contemplating what has happened. While there are no easy answers to such tragedies this exhibition aims to explore how they may develop. To this end this exhibition will provide as its centre point a space for reflection and support with this difficult subject matter including extensive resources looking at anti-bullying initiatives.